The 2015 MMD V-Series and MMD by Foose Mustangs and 2015 Mustang parts have been debuted at SEMA and have captured the spirit of the show! This year’s SEMA show was heavily focused on the Mustangs and especially the 2015 Mustang, the new kid on the block, and all things Mustang as it is the 50th anniversary of America’s pony car. The MMD team was there in full force to showcase their latest designs which focus on the new 2015 Mustang, along with Chip Foose and his MMD by Foose Mustang Parts. 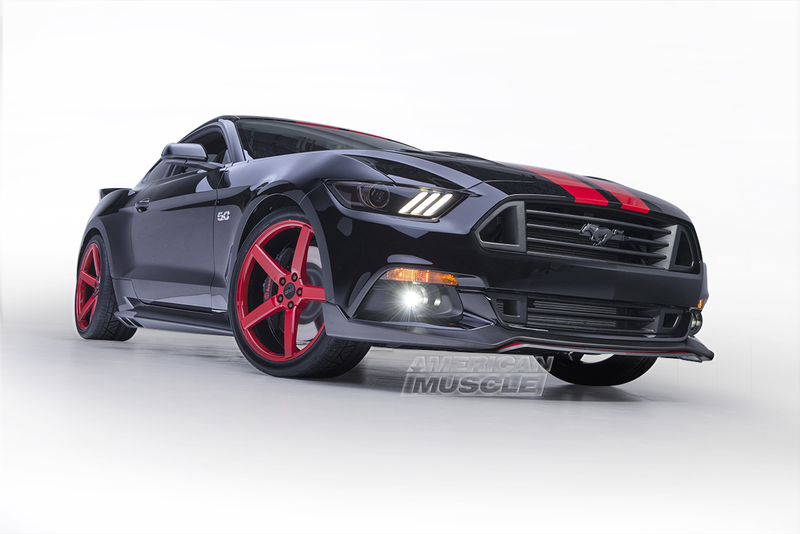 The MMD debuted their new line of 2015 Mustang parts with their V-Series 2015 Mustang. Featuring a sinister black and red paint scheme, the 2015 MMD V-Series Mustang brought the sleek and modern MMD styling to the 2015 Mustang. The V-Series utilized GT500 style stripes which were tapered to match the lines of the hood, a tri-bar upper and lower grille that flowed into a chin spoiler with a color matched extender that really gave the V-Series Mustang an aggressive and smooth look. 551C wheels that were color matched to the GT500 style stripes help to bring attention to the side exit exhaust that gives the V-Series a very distinct rumble. The rear of the 2015 MMD V-Series Mustang is arguably the most aggressive part of the car; with a pronounced rear spoiler that compliments the rear diffuser, the rear of the V-Series Mustang addresses a lot of the issues Ford fans had with the rear styling of the S550 Mustang. The 2015 MMD V-Series Mustang is a mix of beauty and temptation in tangible form. Chip Foose is an automotive legend and hot rod hall of famer for his incredibly creative and unique designs, so it is no surprise that the 2015 Mustang he designed for the SEMA show is nothing short of amazing. Chip took a 2015 convertible Mustang and completely overhauled the exterior of it with parts from the MMD by Foose collection to give it a sense of the hot rodding culture that Chip is all too familiar with. The front of the Foose Mustang is accentuated with a lower front chin spoiler and hood scoop that keeps the clean look of the S550 Mustang while giving a more distinct appearance. With the help of side scoops and a rocker panel, the profile of the 2015 Mustang is improved and the lines become more pronounced and ultimately help to draw the viewer’s eye to the rear spoiler. From color to styling, Chip’s take on the 2015 Mustang is absolutely breathtaking and a great representation of the golden days of hot rodding, presented in a brand new 2015 Mustang. Ford worked with Chip Foose and MMD to display these two Mustangs in the Ford Booth at SEMA, a true testament to the prowess of Chip Foose and the MMD team; Ford also awarded Chip Foose the “best of stand design” with his ’15 convertible. 2015 Mustang owners will soon be able to customize their 2015 Mustang with these awesome MMD parts in the coming months! Next Entry VIDEO: BAMA Sets New 2015 Mustang Record With 10.4 Pass!